Please ring for competitive pricesa on motorcycle brake line kits. 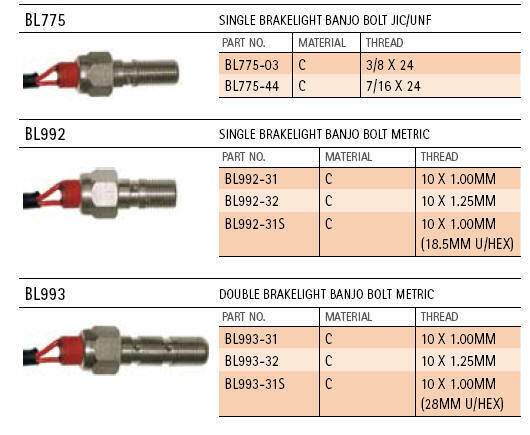 BGC can supply Goodridge ready made brake lines and oil cooler lines which can be sent direct to reduce the lead time. We can also build them in-house using both the swage and the reusable range of fittings. 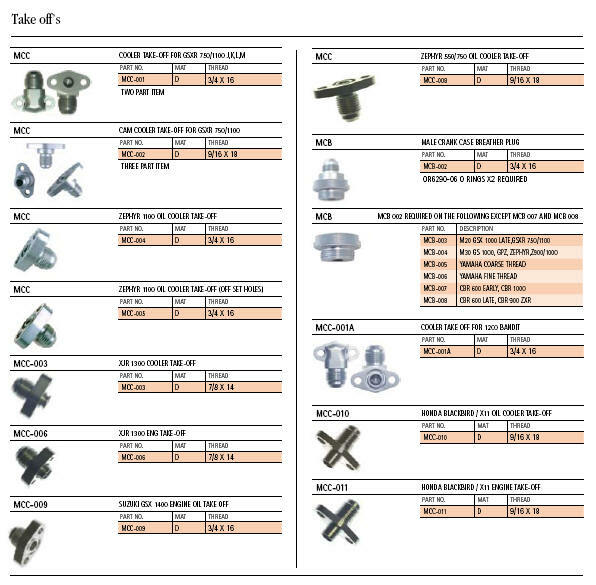 We also supply parts from Earls and Aeroquip as well as other manufacturers. We have been supplying hoses and fittings to the motorcycle, car, kit car and racing market for over 20 years and have experience in the preparation and racing of motorcycles at world endurance level. 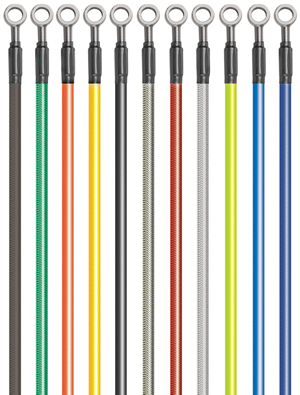 Goodridge Stainless steel motorcycle brake Line kits feature the finest quality hose, consisting of a PTFE inner and a stainless steel outer braid. This eliminates the spongy feel under arduous braking conditions giving greater braking efficiency as well as providing a superior resistance to abrasion and corrosion. These kits not only provide reliability and safety demanded, but offer brilliant looks that improve the appearance of any bike. 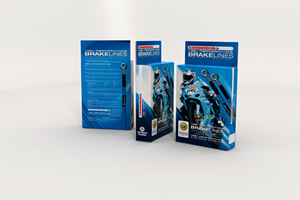 We pride ourselves in being able to supply stainless hydraulic brake line kits for any make or year of motorcycle, be it British, Japanese, American, German or Italian. 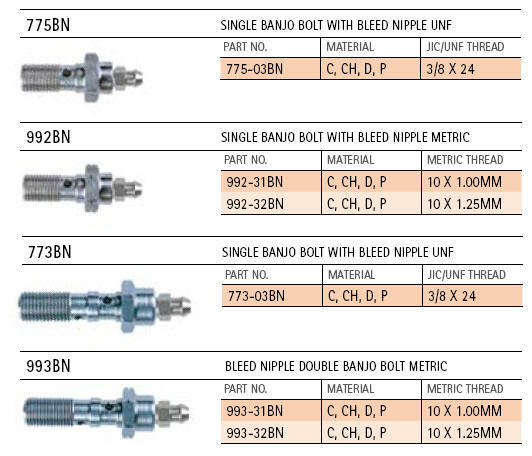 When ordering any non-standard motorcycle brake line please specify the overall length or where possible supply the original lines to ensure exact duplication. Construction: Produced in a stunning variety of translucent colours using a Hitrile Bonding during manufacture - it will stay flexible and will not discolour over time. This new and exciting product is designed for the rider who has fitted their bike with either carbon or colour coded parts and wishes to compliment them with coloured brakelines; available in yellow, blue, red, purple, green, carbon-look and clear cover. Pre-made kits available, call for application guide. Providing a service with hose, fittings and ancillary products that have a world-wide reputation for strength and reliability demanded by professionals. Products that deliver superior performance in critical applications where quality is essential. 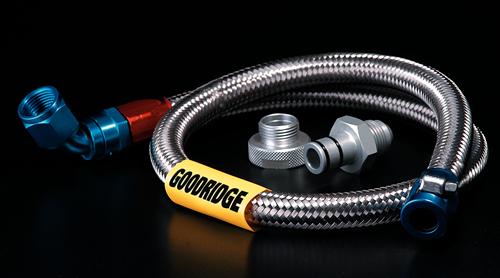 Goodridge have been supplying high performance hose and fittings for over 35 years and were the first company in Europe to offer such a service. These products are now supplied worldwide for every conceivable type of motor sport, fast road car and motorcycle applications, original equipment manufacture & marine and mountain bike uses. Goodridge are justly proud of the high quality of standards achieved throughout their product range and this is attributed totally to the quality control disciplines. Our modern manufacturing facilities allow the production of one off or quantity specials to customers’ specifications in a variety of materials. In addition to service provided by stockist personnel, our highly-qualified engineers work with original equipment manufacturer designing fluid transfer and hydraulic systems. They are also available to analyse problems, which may arise in the field, and to recommend solutions. Our technical representatives are trained to give all clients a total service supported by many years of experience in motor sport applications. Similarly, our sales staff are highly experienced and able to offer advice over the telephone, providing a free and efficient consultative technical service for all installations and projects. Whether the product is stock or to a custom design specification, our insistence on quality standards guarantees our customer a product of the highest possible quality. Whether it is a high performance Goodridge product, or one of our many brand name items we ensure the highest standards are maintained, the standards expected of a progressive organisation determined to live up to its reputation for high quality.